These self-styled prophets, who go around predicting doom and gloom for the world and make crazy outlandish statements and predictions - are hurting all faith groups. More and more our young people become disenchanted with religion and faith as these false prophets abound on TV, the internet and public gatherings. Atheism increases on a daily basis as increasing numbers of youth turn away from belief in God as they see these liars against Allah continue on with their nonsense. 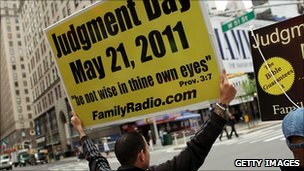 US atheists are holding parties in response to an evangelical broadcaster's prediction that Saturday will be "judgement day". The Rapture After Party in North Carolina - "the best damned party in NC" - is among the planned events. Harold Camping, 89, was the one who predicted Jesus Christ would return to earth on Saturday and true believers will be taken up, or "raptured", to heaven. He has used many broadcasts and billboards to publicise his ideas. He says biblical texts indicate that a giant earthquake on Saturday will mark the start of the world's destruction, and that by 21 October all non-believers will be dead. Mr Camping has predicted an apocalypse once before, in 1994, though followers now say that only referred to an intermediary stage. "We learn from the Bible that Holy God plans to rescue about 200 million people," says a text on the website of Mr Camping's network, Family Radio Worldwide. "On the first day of the Day of Judgment (May 21, 2011) they will be caught up (raptured) into Heaven because God had great mercy for them." The Rapture After Party in Fayetteville, North Carolina, is a two-day event organised by the Central North Carolina Atheists and Humanists. "Though the absurdity of this claim is obvious to the majority of the world, it's a great opportunity to highlight some of the most bizarre beliefs often put forth by religious fundamentalists and raise awareness of the need for reason," said a posting about the party on the group's website. Atheists in Tacoma, Washington, have headed their celebration "countdown to back-pedalling". Events were also due to take place in Texas, Florida and California. Meanwhile Mr Camping says he knows "without any shadow of a doubt" that "judgement day" is arriving. There is no "Plan B", he says. His campaign has been unusually widely promoted - both in the US and overseas, including in the Middle East. In Vietnam, thousands of members of the Hmong ethnic minority gathered near the border with Laos earlier this month to await the 21 May event, the Associated Press reported. He said rolling earthquakes would occur at 1800 in the world's various time zones. The internet has been alive with reactions as the apocalypse failed to materialise in various countries. One early posting on Twitter read: "Harold Camping's 21st May Doomsday prediction fails; No earthquake in New Zealand." Guide US is doing great job, MashaAllah. It is true Jihad that Guide US team is doing, i.e., guiding US to straight path. America really needs more channels like GUIDE US TV.. USA really is in darkness.